Where am I at? No idea. Why did I post a ‘Wordless Wednesday’ on a Tuesday morning, only to add something for my normal Sunday evening post on Tuesday night? Personally, I think this is a symptom of my confusing lifestyle in France. More of that later. Did you catch my two posts about my School Project? 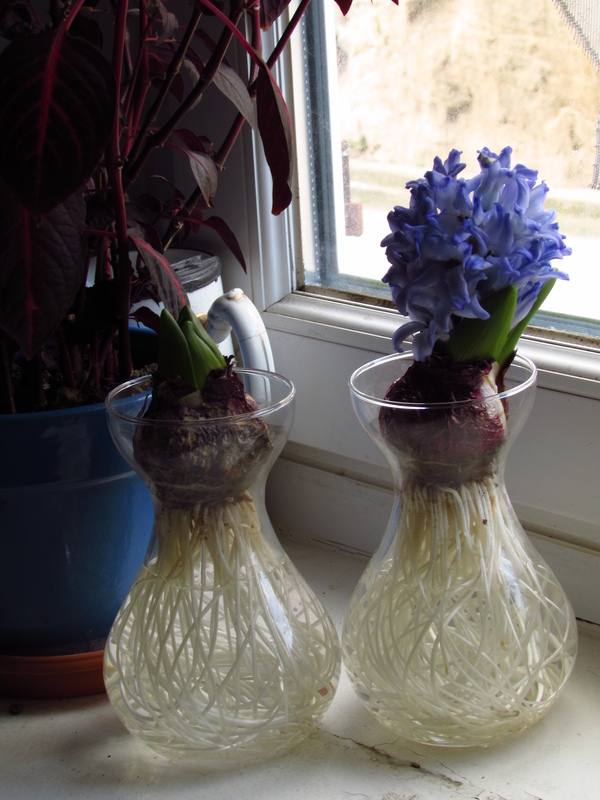 Growing hyacinths bulbs in water seemed very exciting. I was going to take pictures every week. And then my enthusiasm went off the boil a bit … I think this must have been a premonition that all was not well with my two little bulbs. Purchased from Lidl in November, they never lived up to their promise. This is – believe it or not – a picture of one at blooming perfection. 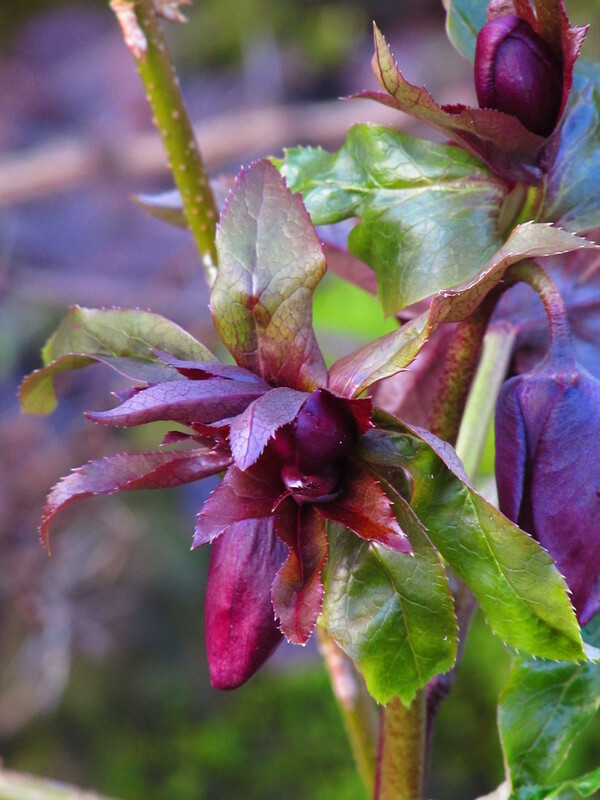 It never really managed to clamber out from its little nest of foliage before the flowers started to dry up slightly. The second is doing the same – if anything it’s even smaller. There was a waft of scent for about a week in January, but nothing much. On first sight in the shop I thought the bulbs looked rather small and wizened – I purchased them late in the day when they’d probably been hanging around in the shop saying, ‘Choose me’, for a little too long. Any ideas? I’ll try again next year. Moving swiftly on: more ‘from me to me’ plants. I live about two hours from Nancy where the redoubtable nineteenth century nurseryman, Victor Lemoine, started his nursery in 1849. 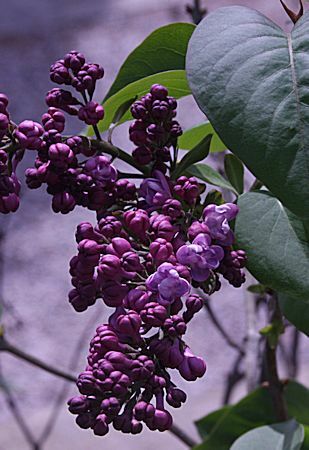 He is perhaps best known for his double lilacs and bred over 200 named cultivars. The Americans still call these modern forms ‘French lilacs’, a fine tribute to the impact his hybridising programme made on the flourishing horticultural world of the late nineteenth century. He was the first foreigner to received the Veitch medal from the RHS. The nursery was only closed by Victor’s grandson in 1960 and I believe there is now a school of horticulture on the site. I’m quite excited to visit this year, since he has definitely become one of my heroes (I’ve always wanted to run a nursery myself). I have a small love affair with lilacs because they remind me of the house of my Canadian grandmother (a great gardener), where I lived for a couple of years when I was small. My grandparents were fruit farmers with quite a lot of land, but it is the steps descending from the kitchen into the garden, shrouded in lilacs, that are my most enduring memory. She and that scent are inextricably entwined. Apparently lilacs were taken to the New World by the colonists who planted them for luck around the door when they threw up a new homestead. 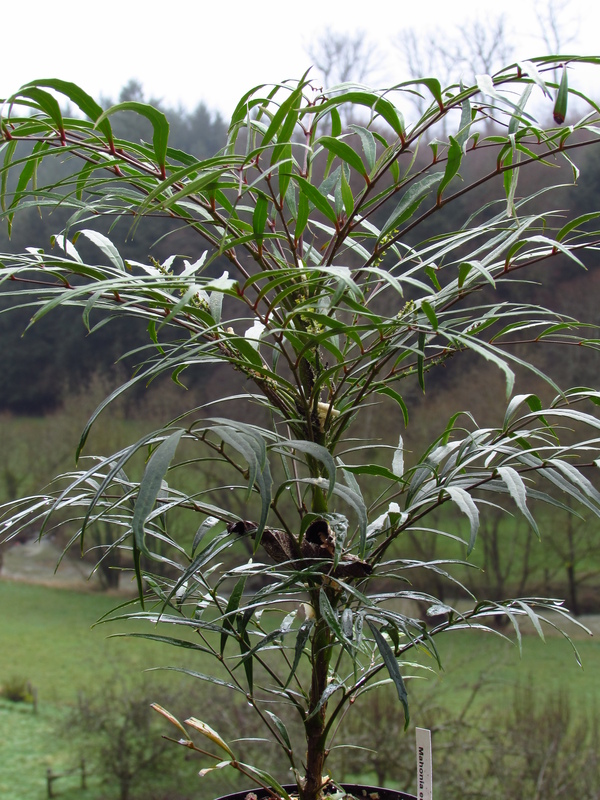 In Scotland we plant rowan – same difference. Lilacs are not the most beautiful shrubs when out of flower, but our garden is large and my memories strong, so I’m hoping to add quite a few. In the first year I purchased purple-red ‘Charles Joly’ (picture above, introduced to the world 1896). He thrives here now, although it was touch and go when his toes were eaten by voles. ‘Madame Lemoine’ went in at the same time. Apparently Victor suffered from failing eyesight in his late forties and was increasingly unable to do the delicate work of pollination essential to the hybridising programme he commenced in 1870, during the Franco-Prussian War (his most important crosses were between S. vulgaris and S. oblata, if you are interested). His wife, Marie-Louise, took over and the superb (not yet superb here!) white cultivar, ‘Madame Lemoine’, was named for her. Her portrait is below, introduced 1890. I love having real people living in my garden. 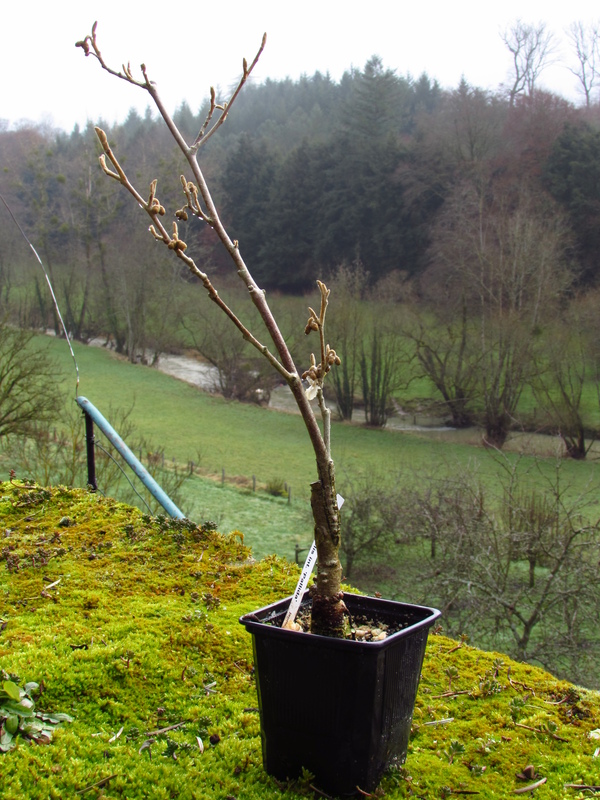 This year I’ve purchased another of Victor Lemoine’s cultivars for the Hornbeam Gardens. ‘Belle de Nancy’ (left) was introduced in 1891 and will be much more the normal deep mauve lilac colour, unlike redder ‘Charles Joly’, but double, fully double, so still one of the lush French hybrids. Another ‘from me to me’ present back in November was Syringa ‘Primrose’ (below). As far as I am aware this has nothing to do with Victor Lemoine’s nursery. Do let me know if I am wrong? But it has everything to do with my brief time with the Notcutts’ landscaping team in Woodbridge, Suffolk. I was elbowed sideways there by a wide guy with a bigger mouth than mine, but in the interim I learned to love this lilac, thanks to some of the pots in the garden centre that I walked through every day. Those days are not happy memories, thanks to the Notcutts’ management, but there are some golden images lingering in my mind’s eye, among them Syringa ‘Primrose’ (and Fraxinus angustifolia subsp. oxycarpa ‘Raywood’ – but that’s another story). I’m really looking forward to growing ‘Primrose’ in my own garden for the first time. 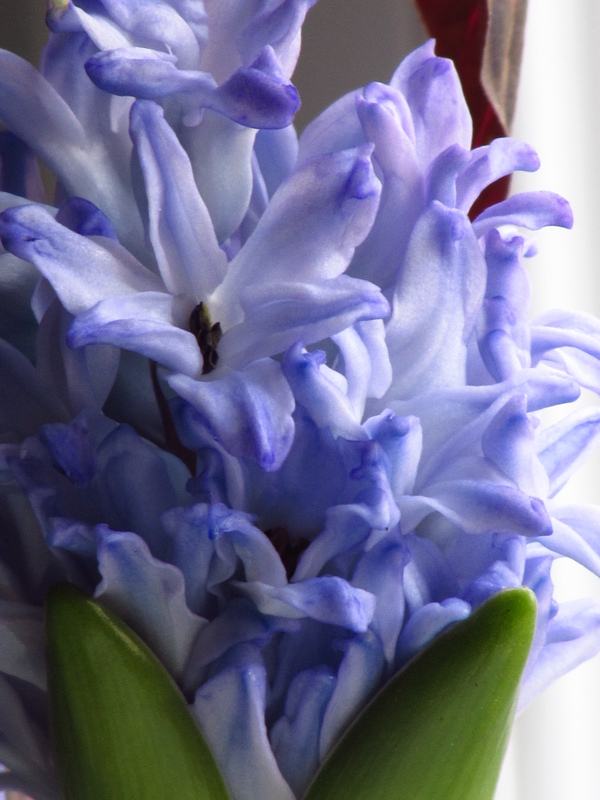 What can you say – a creamy yellow lilac? It’s got to be good for vases with ‘Charles Joly’, never mind anything else. 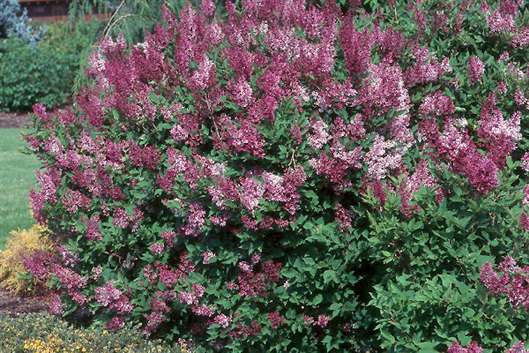 The final lilac I have chosen this year is Syringa pubescens subsp patula ‘Miss Kim’. 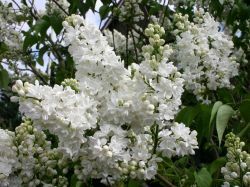 Now what I was really after was Syringa meyeri ‘Palibin’. I think I met ‘Palibin’ first at Branklyn Gardens, Perthshire. Branklyn is near where I come from and last summer I went back to worship the original plant again. Unfortunately the name on the label was not as remembered … I think/hope this is indicative of the fact that I am behind the times with horticultural nomenclature (rather than simply a symptom of my bad memory). Was anyone else in Branklyn at lilac-time last year? Or perhaps I saw ‘Palibin’ somewhere else at the same time ten years ago and the memories are confused? It doesn’t matter. I had met a superb, small-growing lilac with really quite a fine shape (for a lilac), and I began to dream of other ”dwarf’ lilacs. 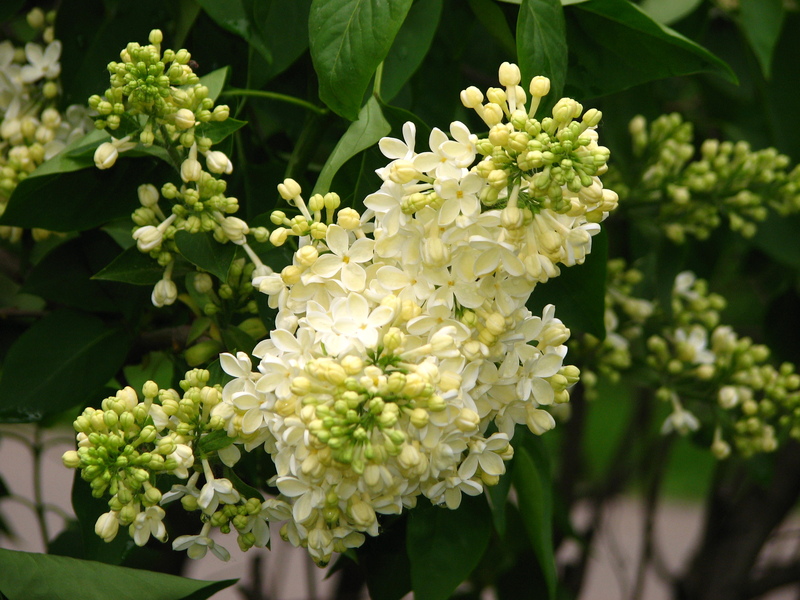 ‘Miss Kim’ is known as the ‘Manchurian lilac’, as opposed to Palabin’s ‘Korean’ common name. Plants make me want to wander … She’s bigger than ‘Palibin’ (to about 2 metres) and looks like being more upright, but I’m up for a lesson in what lilacs can do. And maybe ‘Palabin’ will come later? My final from ‘me to me’ this week needs no explanation. 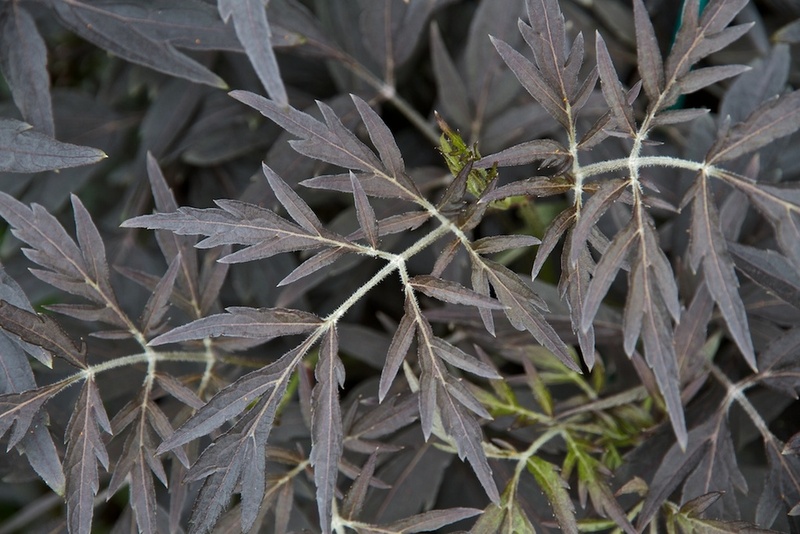 I bought Sambucus nigra ‘Black Lace’. When I lived in Suffolk, straight after my student time at Kew, a dark-leaved elder was one of my first plantings. How can you beat a shrub with such good foliage and all the virtues of our native elder? 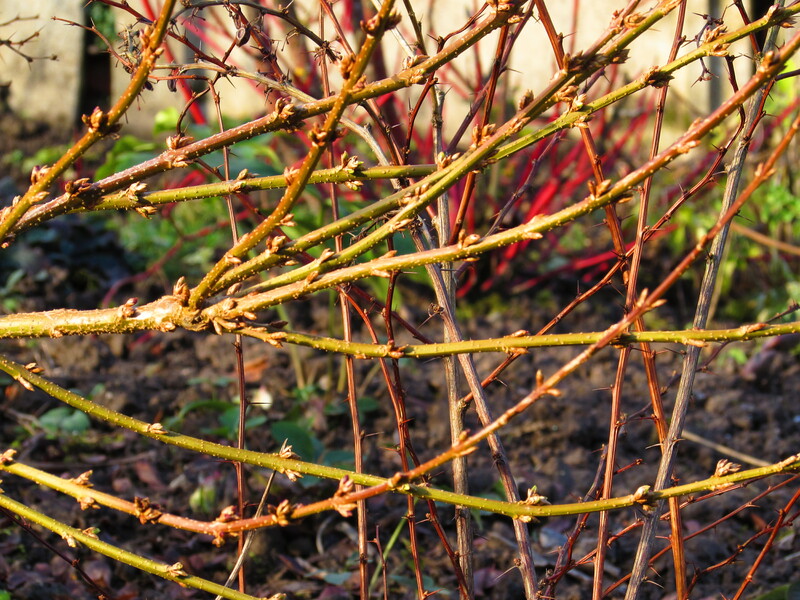 And remember you can coppice it to keep it to size in a border. 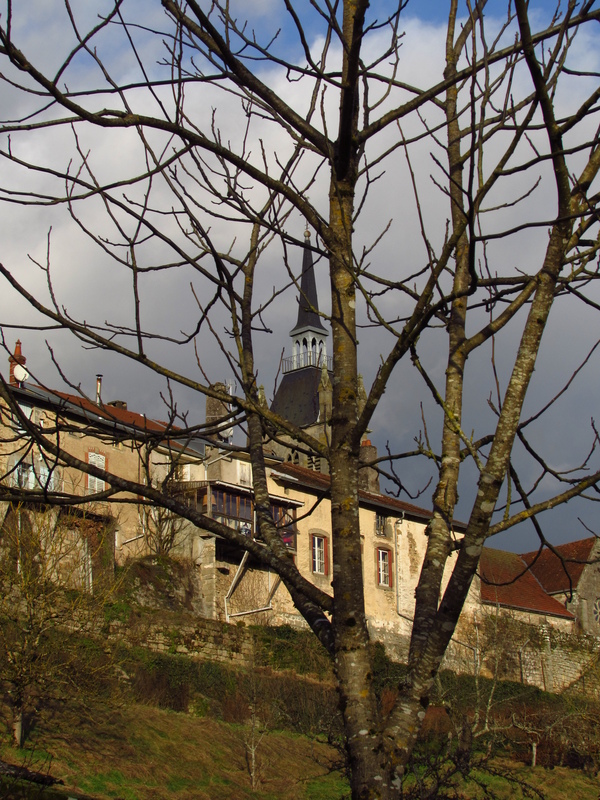 Next week I’m going to give the ‘from me to me’ shrubs a miss to visit the ‘bourse aux greffons’ (a kind of ‘scion market’ for fruit trees) at my local branch of Croqueurs de Pommes (the French heritage fruit society). I’m a member and I’m excited! Hope you’ll be interested too … but back soon with the final additions in the from ‘me to me’ purchases. This entry was posted in Good things this week, Voles on February 3, 2015 by Cathy. 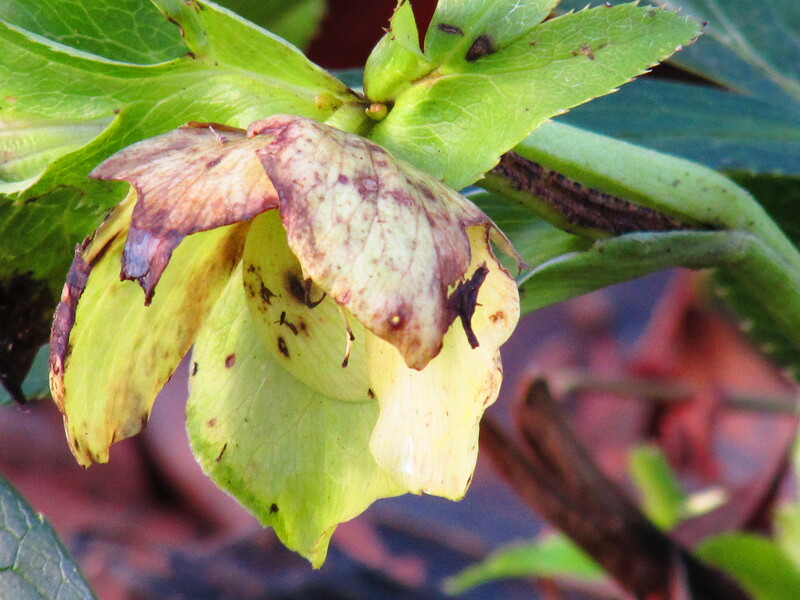 This picture could easily be captioned: ‘How plants cope with drought, damp and freezing conditions’. 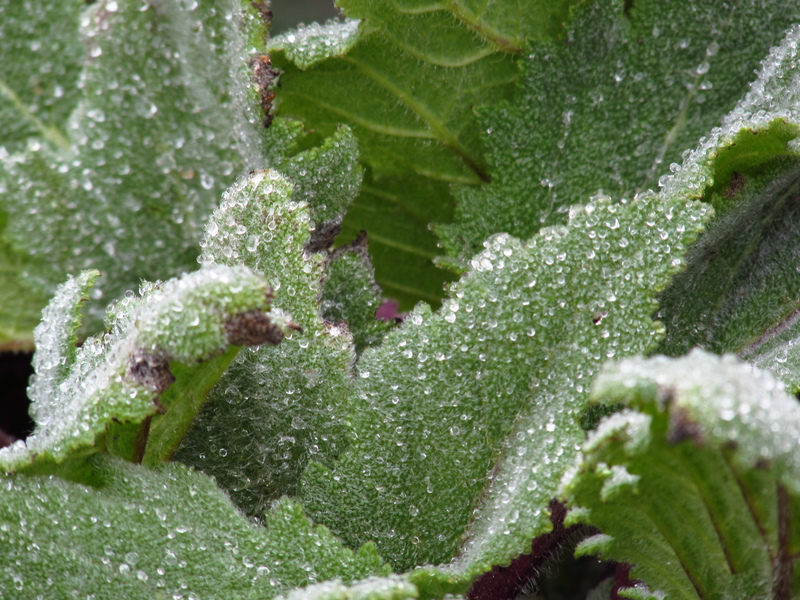 Clever Salvia sclarea does it all with the fine covering of little hairs on its leaves and stems. I admire its rugged adaptability – perhaps I’ll learn to emulate in 2015! January will always be a kind of anniversary for me. It was in January 2012 that I first picked up my fork and spade and got going (two hours a day, an easy schedule) in our new garden. 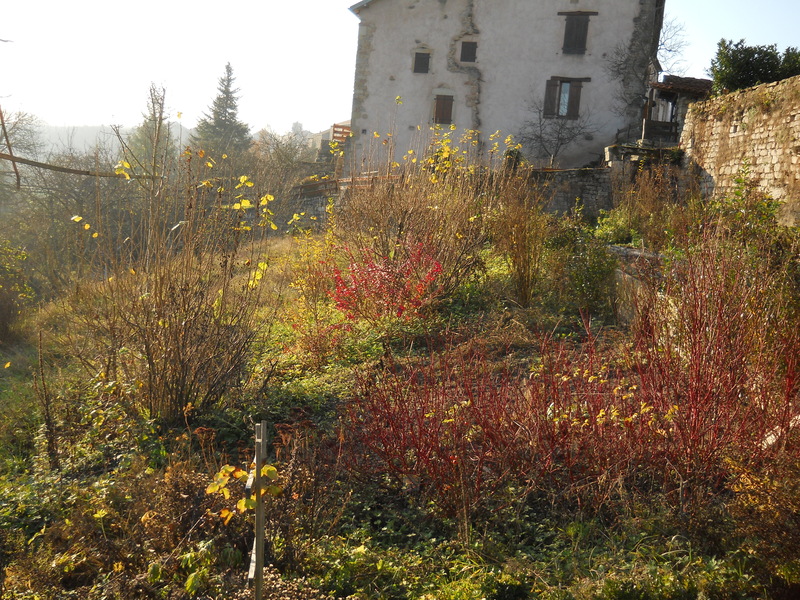 We moved into the house in September 2011, and in late autumn that year this is what the garden looked like. 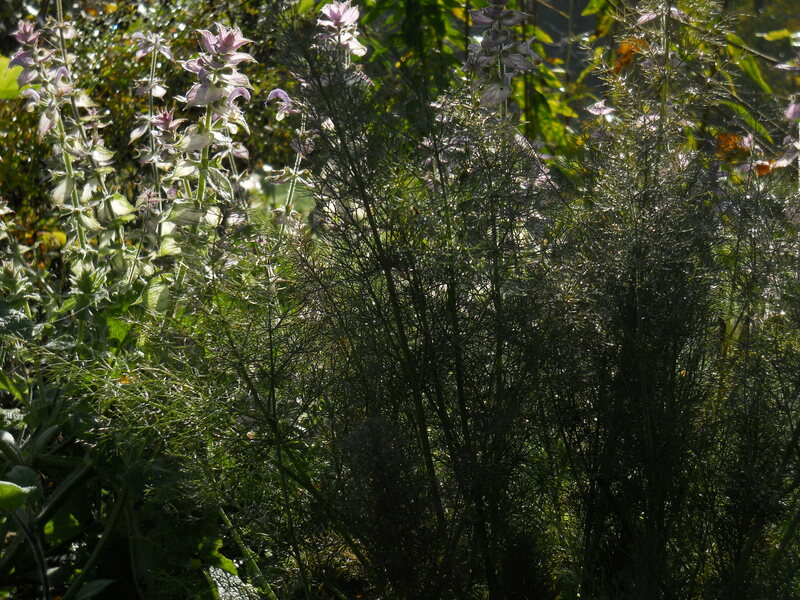 There were very few plants in the garden that I valued. The four hazels, the wonderful box hedges, balls and pyramids planted by the previous owner, some purple Berberis thunbergii f. atropurpurea and a little thicket of Cornus alba ‘Sibirica’ were the exception – oh yes, and I think there was a lovely white aster called ‘Scheekissen’, lost in the ensuing hurly-burly of change. 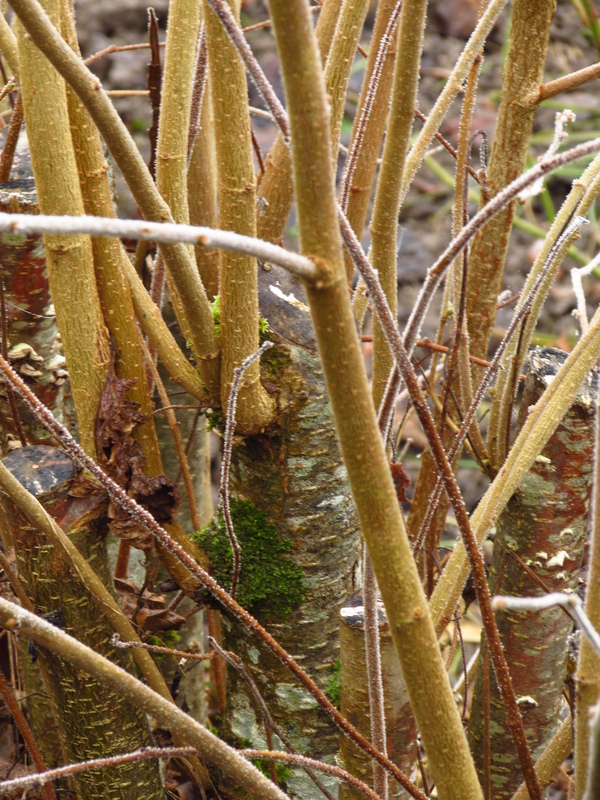 The hazels were coppiced in the winter of 2013/2014 and regrowth has been terrific, although no catkins this year. By April 2013 I had already planted the Rose Walk (and the roses were already being killed off by voles and European chafer). 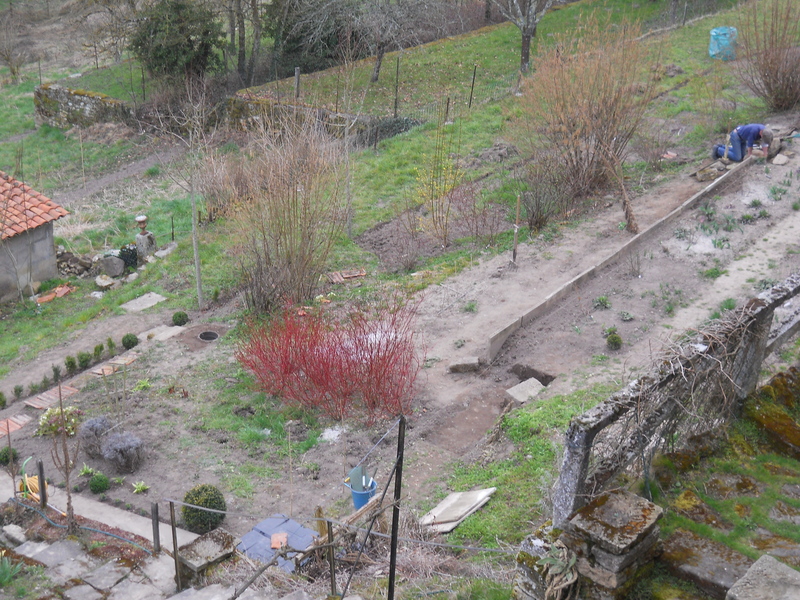 Nick decided to straighten up the awful concrete slabs that had been inserted as a kind of retaining wall. (With little dosh, you make do with what you have!) Once again the Rose Walk and the (as yet undug) Long Border became a kind of building site. 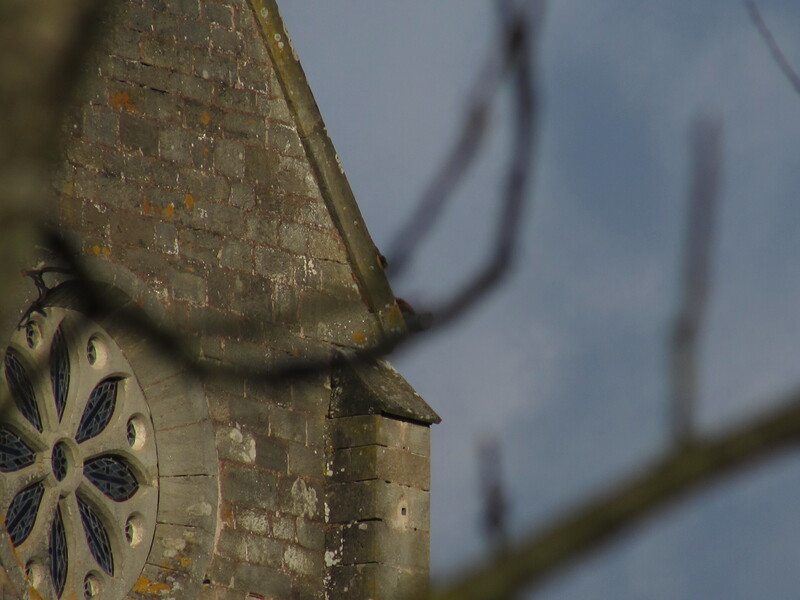 Have a look at the picture below … it was so dry in early April that year. 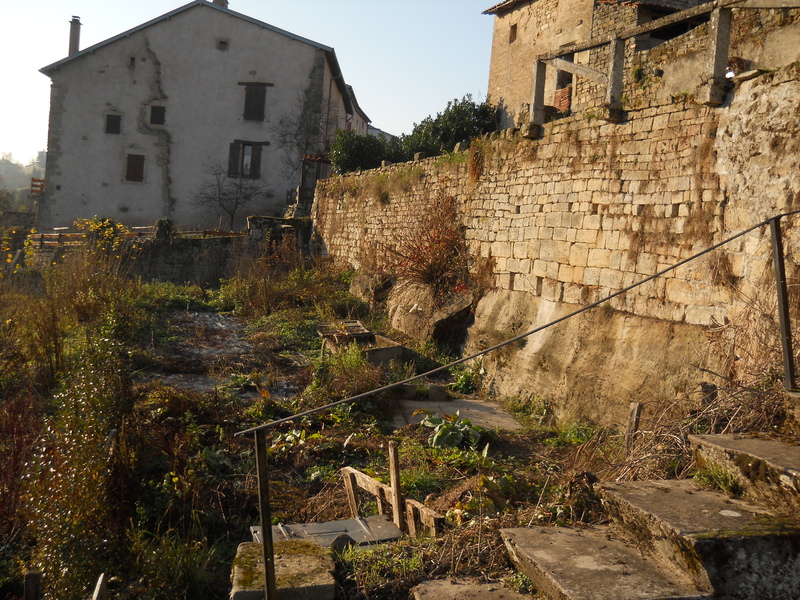 Today I have the bones of the top garden – it doesn’t look much in winter, but last year in late summer I felt for the first time that I had started to make a garden. The work of establishing new levels on the slope and adjusting the lines continues. It’s been a long haul to get this far. 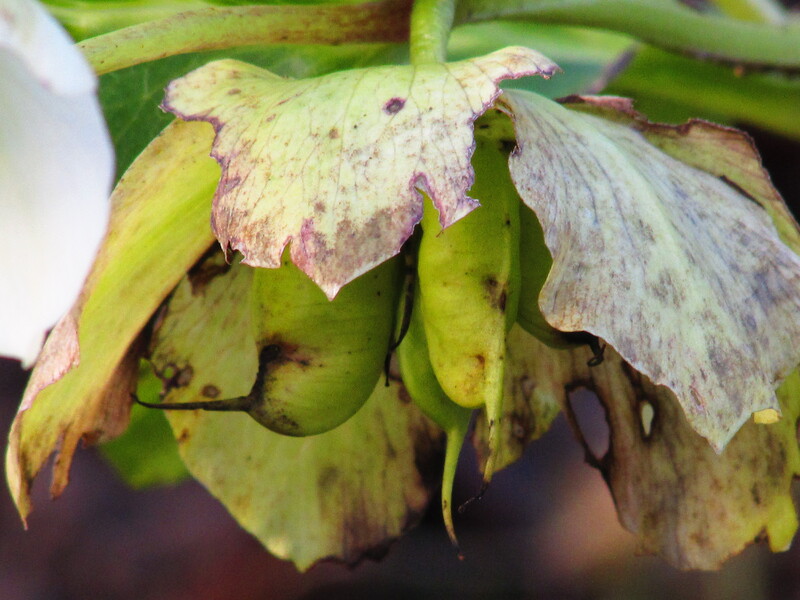 For three years I’ve had failure upon failure (caused by the voles, the chafers and – I began to think – the loss of my green fingers, assuming I ever had them). This has easily been the most difficult garden I’ve tried to make. Over the past three seasons I’ve bought ‘a few’ plants, including 37 seven roses (three of which are still on ‘intensive care’ watch). But I’m definitely breathing a bit easier re our resident garden threats and this winter it was time to go for something other than roses. So, in the middle of December, my birthday and Christmas presents arrived all at once – 26 new shrubs, ‘from me to me’. It’s difficult to buy plants here in France. 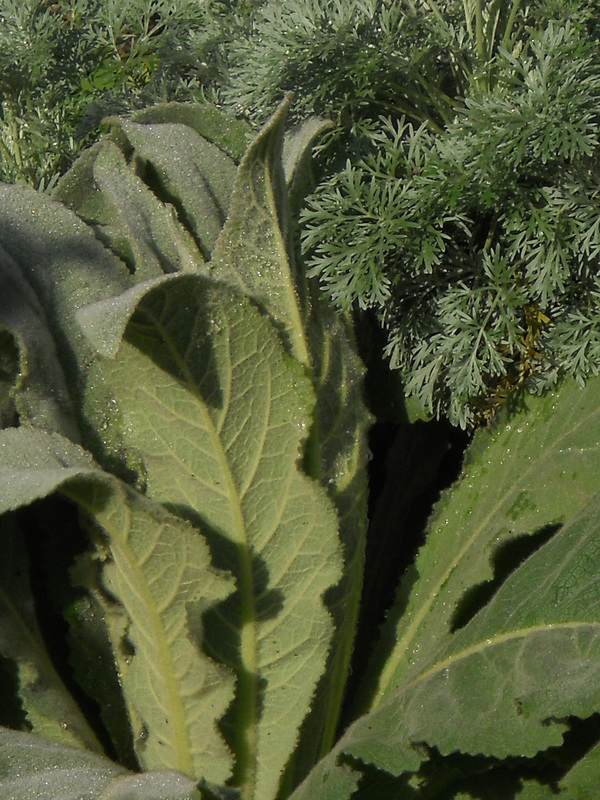 There are only two decent nurseries in our area, both specialising in herbaceous perennials. One about 3 hours away, the other about 3/4 of an hour away. Consequently, unless I want something like a forsythia or a Viburnum tinus, every shrub or tree must come in by mail order. 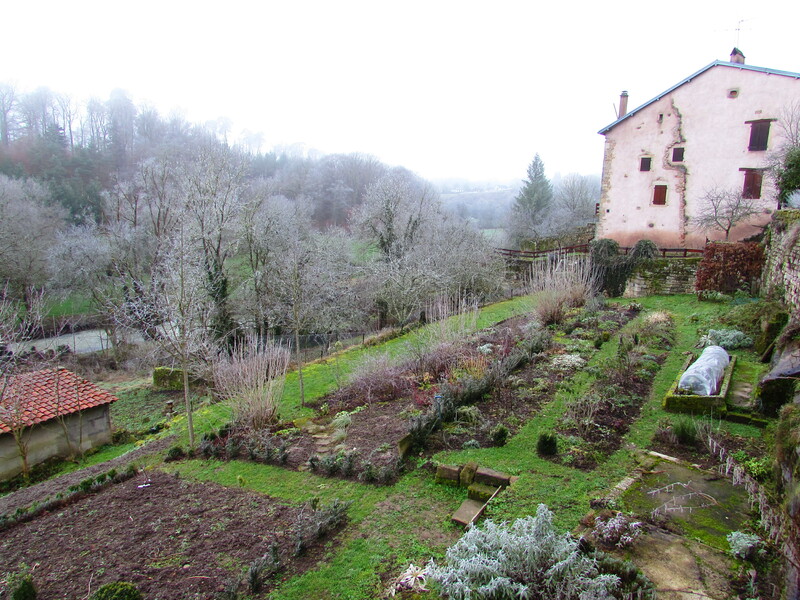 I’ve worked in two really superb gardens and enjoyed what they taught me – especially in winter as it happens. For me, making a garden here has been a bit like assembling a group of friends around me, known and loved for many years, and enjoying getting to know them again. 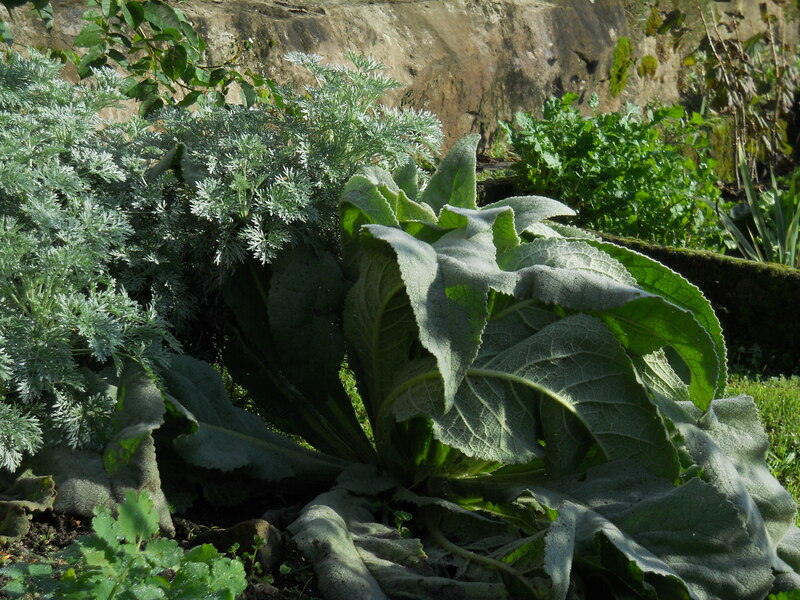 I thought perhaps I would post a bit over the next few weeks about the plants I chose and why I chose them. It being January, it seems obvious to start with the winter flowering plants. Warning! The pictures you are about to see may shock! The plants are tiny; it was only by buying very small plants that I was able to afford my ‘selfie’ present. 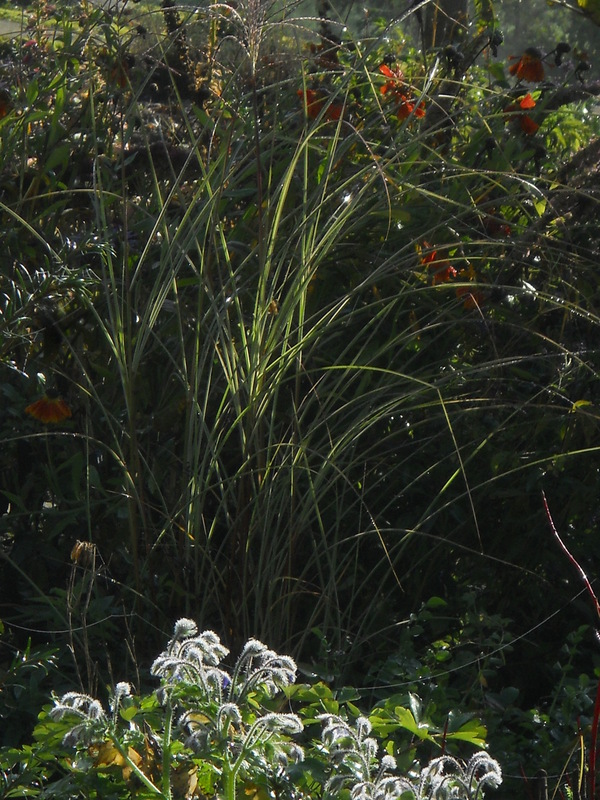 Winter-flowering shrubs are going to be tricky to incorporate in this garden. 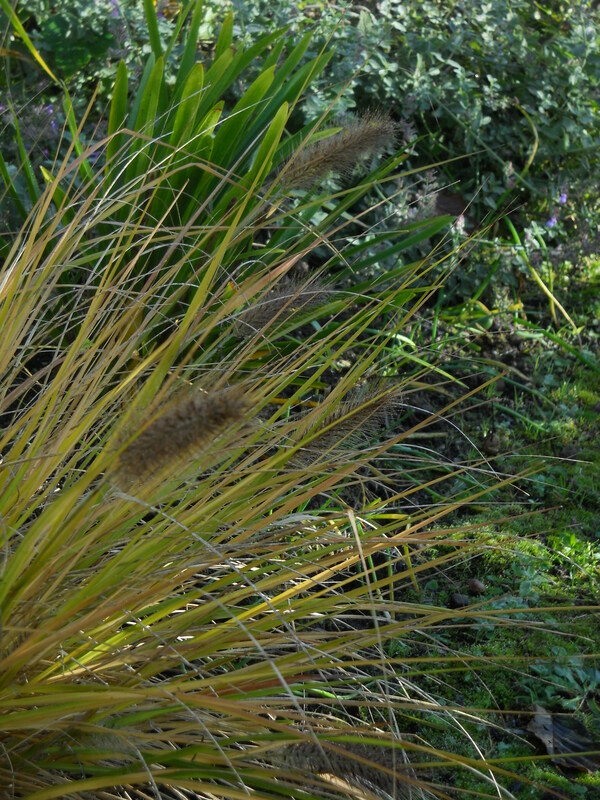 We are always advised to plant them near the house, so that we can enjoy when the weather is harsh. It’s just not possible here. In my mind’s eye I already have a picture of an 80-year-old me struggling down to look at (for example) Daphne ‘Jaqueline Postill’ and breaking a leg (or arm, or wrist) as I descend the steps! There is, however, a small area with a stepping stone path through it where I’ve begun to plant some winter interest. I also have the option of planting in our tiny border on the street, but I prefer to put summer flowering annuals in there. Admittedly my first choice is not very striking at the moment. A tad on the titchy side? But it did only cost me 18€ and these are expensive plants. 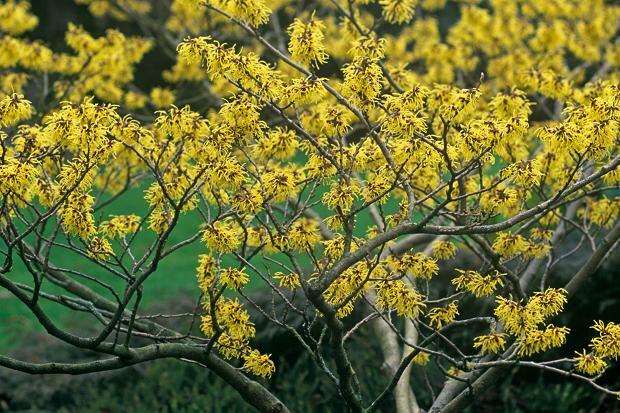 Hamamelis x intermedia ‘Pallida’ Call me a stick in the mud, but in my book hamamelis should be yellow. My most vivid memories of winter botanising are of the sweet scent of Cornus mas (planted here last year) and this hamamelis. I never really got ‘into’ the ‘Jelenas’ & ‘Dianes’ (although I still drool at the pictures posted on the blogs of gardeners more knowledgeable than I!). But when I was lucky enough to walk amongst mature cultivars every day in winter, it was this one I craved. And there’s probably only room for one here. What would your choice be? 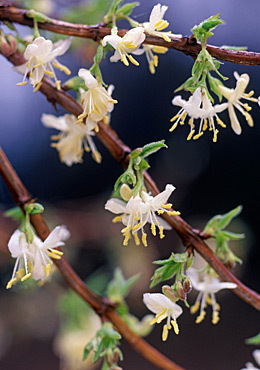 Lonicera fragrantissima and Lonicera x purpusii ‘Winter Beauty’ A winter garden is not complete without the joy their scent adds, so I couldn’t leave them out. 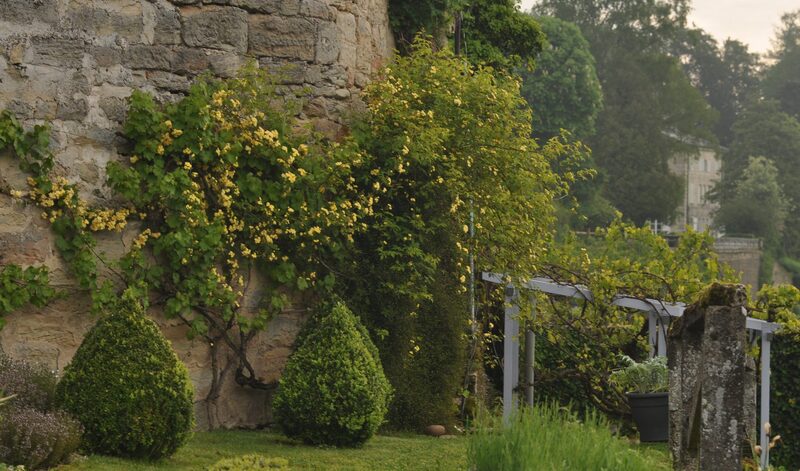 However, they are not the most beautiful shrubs in summer and I think there might have to be one or two ‘exits’ in less strategic places at the top of the garden to accommodate them. 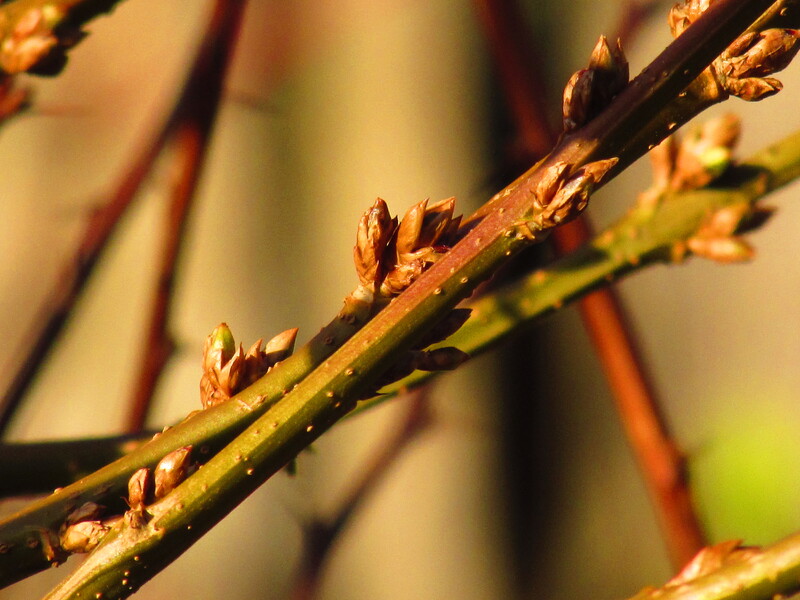 Forsythias – your days are numbered! With the addition of some tough late-flowering clematis I think they could be a luxury (in a relatively small space) that pays off. The picture is of L. purpusii ‘Winter Beauty’ – they are pretty similar; I was just being a bit of a ‘collector’ acquiring both! Mahonia x media ‘Lionel Fortescue’ flowers earlier than ‘Charity’; and I must have a good, big mahonia to enjoy in winter. This one is a candidate for the street, since mahonias are also quite architectural plants and its possible that other people living in the village will enjoy it. 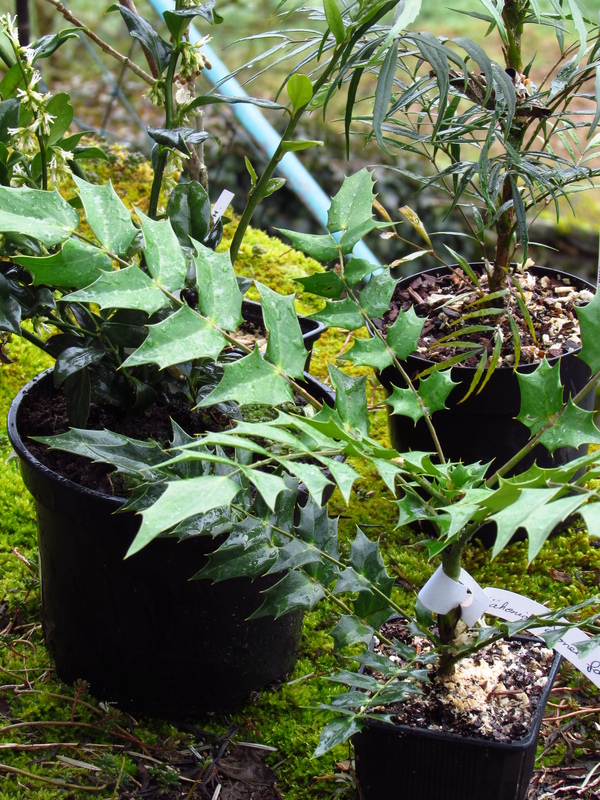 You don’t see a lot of Mahonia x media around here! I also bought Mahonia ‘Soft Caress’ after seeing it and craving it on so many people’s websites this summer. But it will have to live permanently in a pot, I think, and come indoors in winter. It is almost unbelievably a mahonia, soft to the touch and as delicate in foliage as a bamboo or a grass. I have a small grass/bamboo collection on our supper terrace, as well as a few hostas and camellias in pots to benefit from the shade, and I think this mahonia will be a plant I appreciate all year. Viburnum x bodnantense ‘Charles Lamont’ Only room for one Viburnum x bodnantense and ‘Dawn’ was not available at the nurseries I used. It’s a kind of similar situation to winter-flowering loniceras really. In order to place it, I think something else will have to move home (fortunately the bank down to the Long Border is quite big, and I have a lot of duplicate weigela, philadelphus and so on that I did from cuttings that can go down to the bottom of the garden). And, great excitement, my plant is big enough to flower! 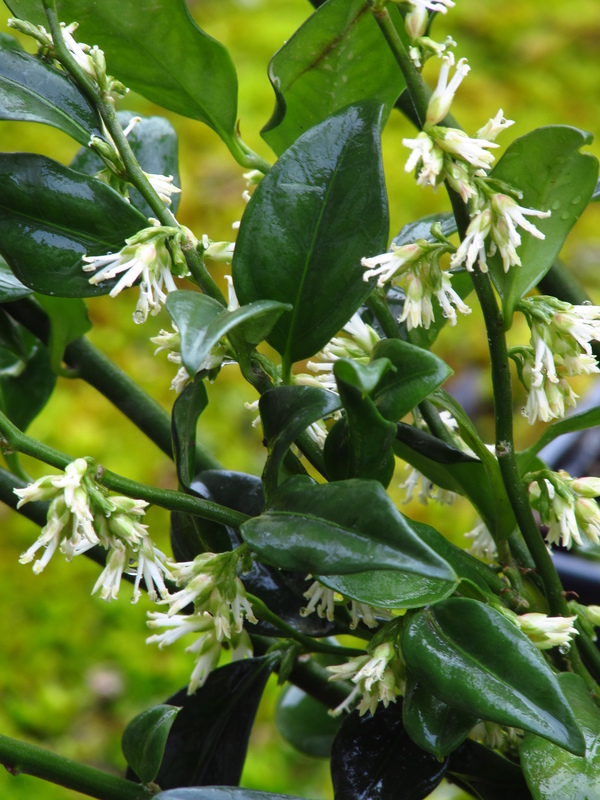 Sarcococca confusa They are essential for their scent, hardiness and evergreen character, aren’t they? I’d have them all – and probably will in the end. Fortunately easier to place than the big shrubs, because (with clipping) this is not going to grow above about 50cm tall. They also got me thinking that when I finally get the greenhouse I dream about I’d like a little mist unit to take cuttings of evergreens. Hollies for example, as well as sarcococcas. 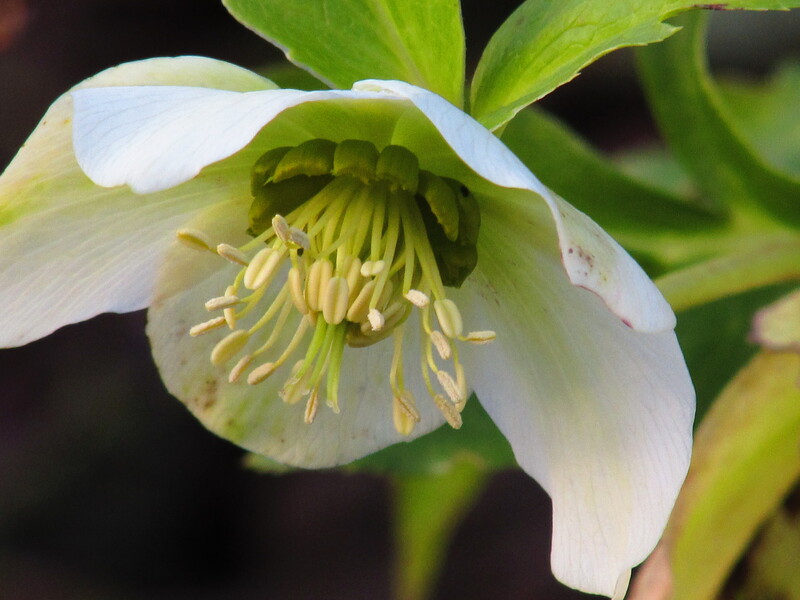 Next week I’ll list a few more of those special ‘from me to me’ plants as well as posting pictures of the new part of the garden (which I’ve just started digging) where the spring-flowerers will find a home. This entry was posted in Good things this week, Voles on January 18, 2015 by Cathy. 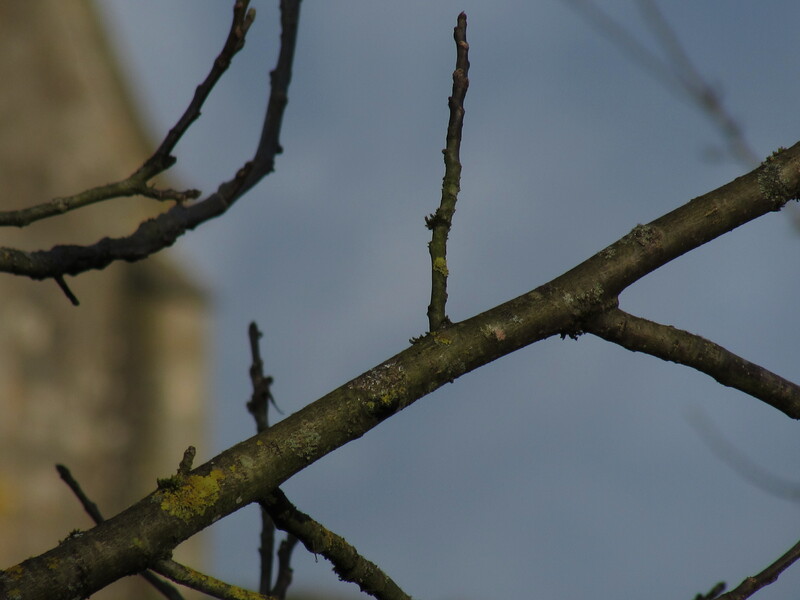 In 2014 I’m watching this little walnut at the bottom of our garden near the river. It is, I believe, Juglans regia, although we have the other common walnut, Juglans nigra, in the garden as well. Incidentally, the word walnut seems to be a direct descendant of the old English word for the tree, wealhhnutu, meaning ‘nut of the Roman lands’, to distinguish it from native hazel. I always thought we were a bit special (although perhaps not in a good way!) Mrs Grieve’s Modern Herbal, published 1931, tells me that during the ‘golden age’ (probably a classical reference?) when men lived on acorns, the gods feasted on walnuts. And we have five trees in the garden to make us special! Five is too many actually … Walnut roots exude juglone, which may be toxic to other plants for a 50 to 60 foot radius from the trunk of a mature tree. When I looked after a woodland garden at Kew, the mature Juglans nigra at the entrance made some plants very tricky to establish, but there was a large, rather lovely patch of a pink Orobanche (‘broomrape’, afraid I can’t remember the species), a parasitic plant that delighted in the walnut roots, when nothing else did. Given that walnuts are not ‘plant-friendly’, I am quite sure that five is too many for a half-acre garden. We need some lovely shade-giving trees that will nurture some of my favourite woodland species, rather than kill or alienate them slowly and quietly. But, as I said, at the moment we have both the common species in the garden. My challenge for 2015 is to work out which is which. (Nick, my husband, knows; he’s keeping it a dark secret.) One of the reasons I wanted to ‘follow’ two of the young trees is because they leaf up so very late. Mrs Grieve tells me that Juglans regia (called English walnut by Americans, to differentiate it from their own species) flowers in April and is in full leaf by the middle of May. We’ll have a long wait for these buds. 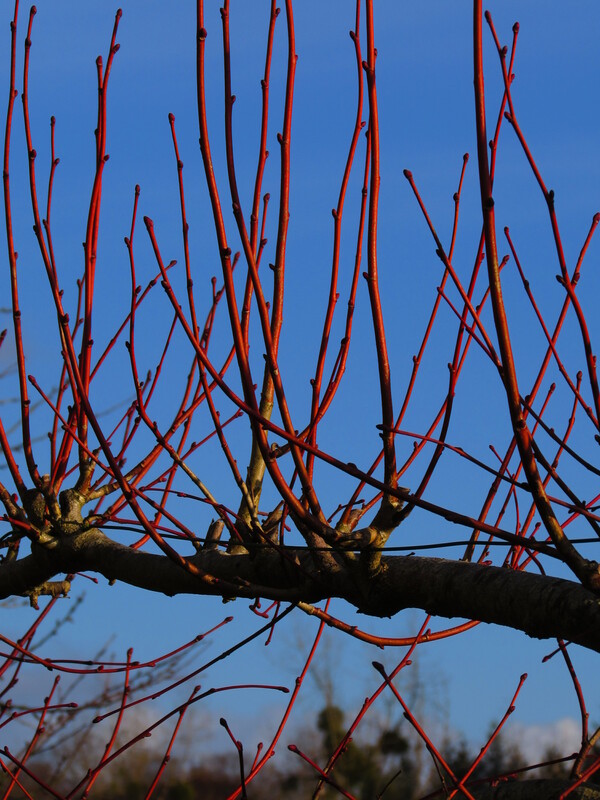 The tree in my pictures today comes into leaf around the end of May/beginning of June. The other tree did not come into leaf until an astonishing July in 2014. The parent trees are in leaf well before that, although the putative parent of the late-leafer was in leaf by the beginning of June last year. I read, however, that even in the south of France walnuts are sometimes injured by late frosts. So perhaps that’s the reason for the very late habits of the trees in my garden? (Or maybe they’ve been infected by my husband’s tendency to get out of bed late; he spends a lot of time in their company and it may have rubbed off?). The Châtillon walnut saga continues next month (hopefully nearer the correct date on the 7th). Meanwhile, go to Lucy’s page and enjoy the offerings of the other curious ‘tree followers’. Garden Blogger’s Bloom Day I poked about yesterday under the lovely cosy hazel leaves covering them and, yes, there are snowdrops! ‘Warham’ is virtually in flower (see Wordless Wednesday), but ‘Sam Arnott’ and the common doubles and singles are lurking down there as well. Thank goodness; I live in fear that these expensive bulbs will be ‘had’ by the voles. They shouldn’t be eaten really, as they are in the daffodil family and Narcissus spp are not the preferred food of these little blighters. Or at least so I thought; last year I read that the latest personal challenge the voles of France have set themselves is to destroy the huge wild N. poeticus populations of the Massif Central, used in the perfumery industry. Anyway – my snowdrops live to bloom again in 2015! Less expected was a smattering of early crocus on the Iris Garden lawn and Helleborus orientalis already bearing seed (they were flowering in the very mild late autumn). The flowers are battered but (sort of!) unbowed. 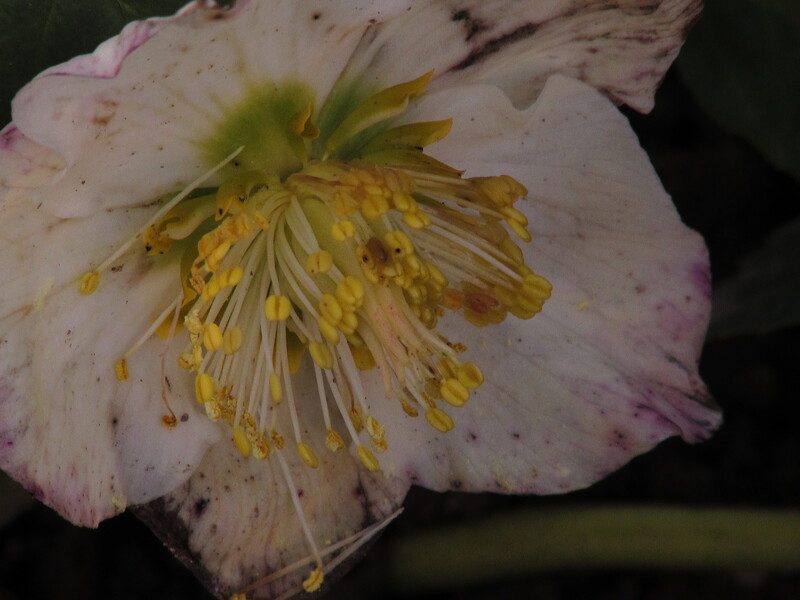 Ditto the small patch of Helleborus niger. The pure white flowers of these are so bashed and beaten by the elements that I’m seriously considering acquiring a few of those Victorian bell jars to protect them. Or have you a better idea? I don’t like Forsythia ‘Lynwood’– at all (at all)! 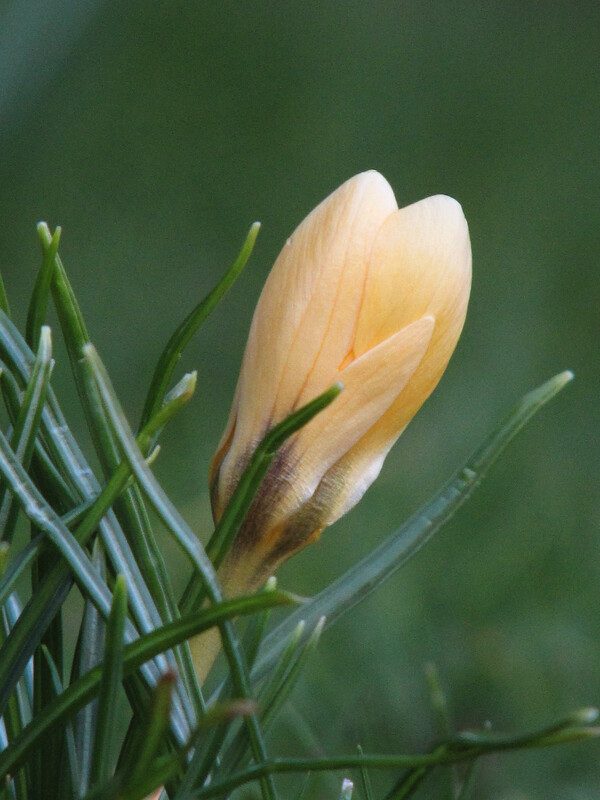 Its common shade of glaring yellow in spring is all very well in other people’s gardens (where I enjoy it), but given a choice I’d not let it into my own. I inherited two here and have to steel myself to remove them where they don’t scream ‘Look at me!’ all the time. 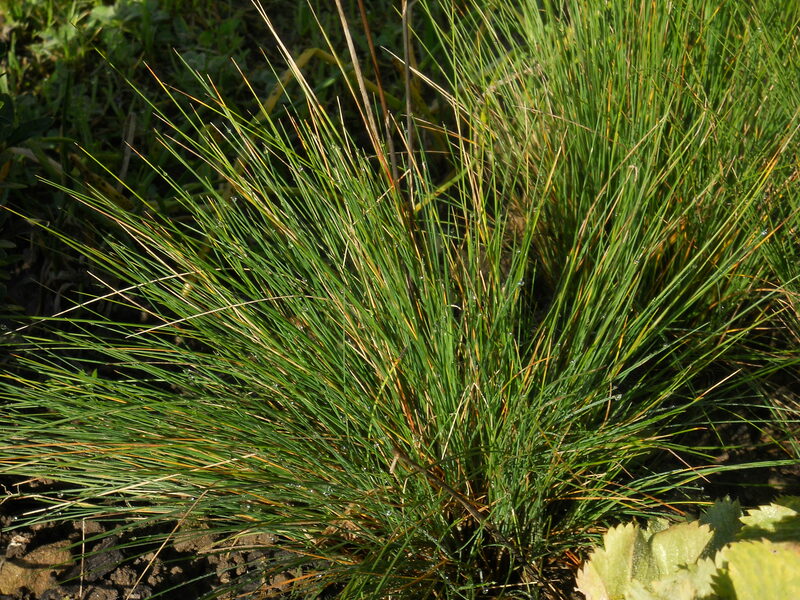 As for that habit they have of producing fasciated branches at the drop of a hat when there’s any physical damage to the plant? Not fascinating at all to me – just plain ugly! In January they are lingering at the stage I prefer. I can cut them and bring branches into the house for forcing. Warms the kitchen in the dreary days of February. That’s about all that’s flowering at the moment. Garden Bloggers’ Bloom Day is hosted by Carol at May Dreams Gardens. Click on the link to see what other garden bloggers have on the go at the moment – more than me, I’ll warrant! 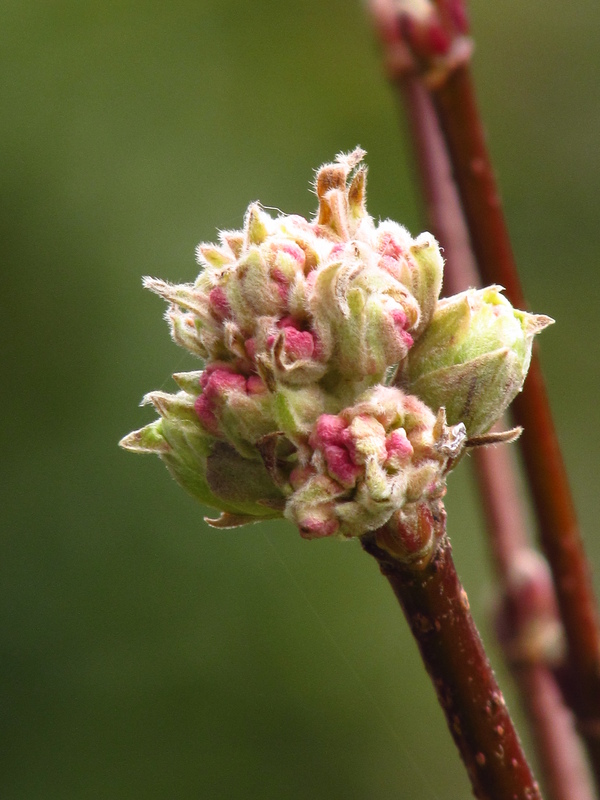 But I do have colour from the dogwoods and I always appreciate the young stems of our peached limes. Erddig, a National Trust property near Wrexham, has (I seem to remember) a wonderful row of pollarded limes with Tenby daffodils naturalised below them. Might be an idea for our three standard limes that I can’t make my mind up about? Against a bright blue January sky (which seems all too rare these days!) the coral-red of those twigs is a real picture. 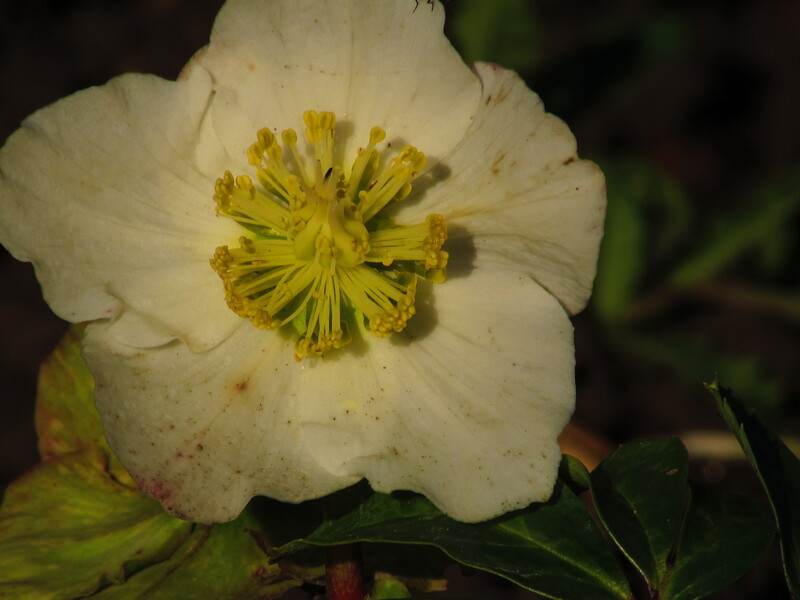 This entry was posted in Garden Bloggers' Bloom Day, Tree Following, Voles on January 15, 2015 by Cathy.